As part of a collaborative initiative between Goal.com Japan and the satellite broadcaster JSports, I will be penning a column on the English Premier League this season for Goal.com’s Japanese and other Asian versions. This latest one quickly sparked a bit of debate – not something that usually happens on my tactics pieces, I must admit – with some very kind readers fighting my corner in response to those who hadn’t realised that the article was intended to introduce, rather than add to, the comparative impressions of Eden Hazard and Shinji Kagawa that have evolved in my native country. Oh, and some Korean readers felt that this must have been written by a Japanese ultra-nationalist. Always nice to do my bit for international relations. Eden Hazard and Chelsea will be the subject for analysis in this Tuesday’s episode of Foot! on JSports. 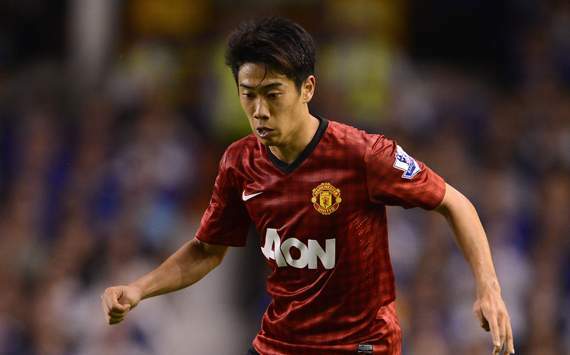 But why has reaction to his arrival in England been so different to that surrounding Shinji Kagawa at Manchester United? In Europe, still by global standards a wealthy and peaceful place to live in spite of the Eurozone crisis and associated political fallout, we can be prone to obliviousness as regards affairs outside our borders. This is particularly true in the United Kingdom, whose islands never did sign up to the single currency (sensibly, as it turns out) or even the Schengen Agreement (that one’s a little more paranoid) in the first place. As such, the Premier League rights-holders Sky Sports may well invest plenty of time and microphone volume into triumphantly telling us Brits that ours is the best football league in the world, for example, but any effort extended to detailed justification would probably be superfluous; we are already being told what we want to hear. This actually has its benefits – a self-fulfilling prophecy, if you like, whereby inflated excitement prompts more people to spend more money watching football on television or at the stadium, thereby supplying the investment with which English clubs can plot to overwhelm their continental rivals. (We’ll leave the moral implications and unsustainability of the current, inflated financial model to a later column.) But where such an attitude really comes into its element is in the way we absorb and respond to information from outside. When the transfer of Shinji Kagawa to Manchester United was announced on 5 June, the dominant public and press reaction seemed to analogise the Red Devils’ acquisition to a silver medal in Olympic year; the gold, of course, having been stolen from their grasp 24 hours earlier when Chelsea confirmed their £32 million signing of Eden Hazard from Lille. Even Jamie Jackson in the normally more considered Guardian penned a piece that declared the arrival of Kagawa, at only just over half the price, as typical of “United’s new age of austerity”, although he did at least take to YouTube and verify that the Japanese international might yet do a decent job at Old Trafford. Evidentially, however, there was never any reason for British observers to deride Kagawa as a second prize while simultaneously proclaiming Hazard as “Europe’s most exciting prospect”. It might have been inevitable that Borussia Dortmund fans should initially doubt the ability of a €350,000 purchase from Cerezo Osaka, freshly promoted from J2, to inspire their Bundesliga revival, but they were quickly won over by the goals, assists, and sheer hard work that brought a succession of team and personal honours. The Belgian, meanwhile, was Player of the Year in the slightly inferior Ligue 1, but arrives off the back of the first season in which he really turned his terrific potential into tangible end product. If anything, Hazard may be the more explosive, but Kagawa is the more rounded. So why such a difference in public reputation (and transfer fee)? Is it because British fans watch more French football than German? Surely not, since they don’t follow either. Is it a nationality thing? Well, sadly that may have something to do with it, but only to a minor extent. No, it really all boils down to the respective levels of superficial hype that were generated around the players and fed to us before they even arrived in England. Hazard used both Twitter and his agent to effectively bandy his services around a number of potential suitors, ensuring that his name would rarely be out of the newspapers and an auction could ensue over wages and compensation to Lille. Kagawa, meanwhile, simply got his head down and got on with the business of performing for Dortmund to earn his chance elsewhere. The end result is that, now both players have made impressive starts to their Premier League careers, Hazard’s headlines have been all about matching the lofty expectations while Kagawa has attracted rather more surprise. The Chelsea man is under pressure to perform immediately, though it is pleasing to note from his post-match comments that he is level-headed enough to demand, rather than simply expect, the highest standards of himself. United’s number 26 has much more leeway for acclimatisation – especially now he has been usurped by Robin van Persie as the ‘biggest’ new arrival – but with Wayne Rooney’s unfortunate injury, he should now get a sustained opportunity to prove that he never needed such special consideration anyway. It is in the interests of all English fans and to the self-proclaimed status of the Premier League that both Hazard and Kagawa should shine in their new environment. It will be of great interest to observe how their comparative development paths will progress. My latest J. League tactics piece for Goal.com Japan looks at a surprise victory for FC Tokyo away to J1 leaders Sanfrecce Hiroshima. Without a win in five league matches – a run that incorporated ignominious defeats at home to both Albirex Niigata and Omiya Ardija – FC Tokyo manager Ranko Popović’s novel means of approaching a trip to J1 leaders Sanfrecce Hiroshima was to mimic their idiosyncratic 3-4-2-1 system. This was perhaps not as great a surprise as it sounds. The Serb had previously experimented with a back three in the second half away to Urawa Reds earlier this month, inspiring a comeback from two down to draw 2-2 against the one other side in the division to favour the ‘Hiroshima’ formation; managed as they are by erstwhile Sanfrecce boss Mihailo Petrović. But what it did do was to cancel out the hosts’ natural avenues of threat by essentially ensuring that every single player on the pitch had a direct opposite number. In this sense, the tactical move may be seen as more of a defensive decision than it was against Urawa; an argument supported by the deployment of Yuhei Tokunaga on the left to mark Mihael Mikić, rather than on the right as anticipated. That said, Tokyo began the game as the more attack-minded, playing with a higher defensive line as Sanfrecce sat back and looked to hit on the counter. It was here that the latter’s familiarity with the nuances of the 3-4-2-1 system paid dividends, with a defender always on hand to cover as the visitors would misjudge the angles of their runs and passes. Hiroshima were then more efficient at getting the ball forward into chance-making areas, developing the right flank with Ryota Moriwaki breaking out of defence to double up with Mikić on Tokunaga. Tokyo grew wary to the danger midway through the first half and began to hold off a little. The game became rather chess-like – which is a nice way of saying ‘dull’ – as both sides kept the ball in their own halves without really going anywhere. During sustained periods of Sanfrecce possession, Tokyo looked more like a back five. But perhaps this period allowed Popović’s men to settle, and in the final ten minutes before the interval, they began to play the ball over the opposing defence and won a succession of corners. The overwhelming sense at this point was still that the opening goal, if one came at all, would most likely come from a Hiroshima counterattack, but that if Tokyo could continue to quell that threat, they might nick one themselves via a set piece or a moment of magic. As it was, Lucas produced just that to score the game’s decisive goal four minutes after the restart. After Hiroki Mizumoto had shot rather wastefully off target from long range, Shuichi Gonda sent a long goal kick down the other end that eventually resulted in a throw-in to Sanfrecce deep by the corner flag. This was intercepted by Takuji Yonemoto, and the ball was played on first to Kenichi Kaga high on the right flank, and then to Naohiro Ishikawa. His pass found Lucas in space between the Hiroshima back three and deep midfield two, and the Brazilian took two short touches to enable a shot through Moriwaki’s legs and into the far corner from the edge of the D.
The disappointing thing from the title favourites’ perspective thereafter was their inability to develop upon their Plan A. The transition of the game’s pattern was slow – only gradually did Sanfrecce begin to show more urgency, push Tokyo back a little, and shoot on sight from distance. Hajime Moriyasu’s substitutions did nothing to diminish the impression that he and his team only know how to play one way. When they did dominate the possession, they were greeted by determined pressing from Yonemoto and Aria Jasuru Hasegawa once they passed halfway, and were afforded little space in vital areas. Even so, they still ought to have at least drawn the match. Hiroshima remained the better side and created a number of chances late on as the hard-working Tokyo players’ energy and concentration levels inevitably expired. Hisato Sato missed twice in a manner unbefitting of such an in-form goalscorer. In the dying seconds, a glorious cross (and prior build-up play) from Hwang Seok-Ho presented the perfect opportunity to Hironori Ishikawa, and blazing over was simply unforgivable. 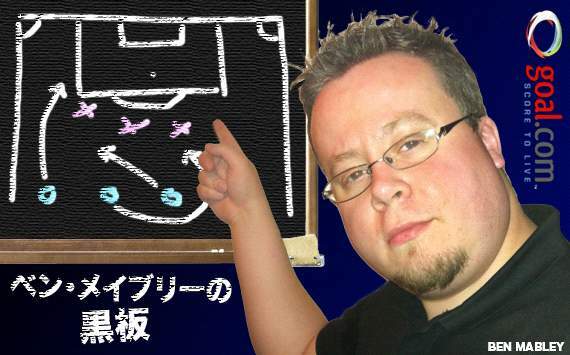 As part of a collaborative initiative between Goal.com Japan and the satellite broadcaster JSports, I will be penning a column on the English Premier League this season for Goal.com’s Japanese and other Asian versions. 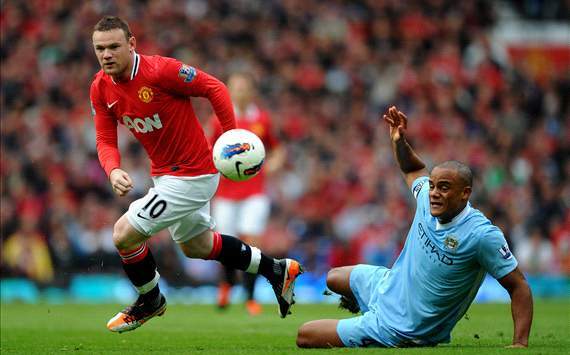 Below is my Week 1 article, written after the opening round of Premier League fixtures. Across the United Kingdom, and even for British ex-pats like myself, it has been a strange – almost non-existent – build-up to the start of the domestic football season. The nationwide euphoria surrounding the successfully hosted London Olympic Games decisively shifted the national sport away from both newspaper headlines and public conscience. An atmosphere of humility and humanity among Team GB’s 29 gold medal winners and many other Olympic heroes, meanwhile, contrasted uncomfortably sharply with the ongoing racism scandals that are merely symptomatic of the disassociation we feel with our millionaire footballers. Even the England manager, Roy Hodgson, felt compelled to stress the importance of behavioural decency ahead of an opportunity for friendly revenge against Italy that nobody gave a damn about. As such, it will have come as a welcome relief to everyone associated with the Premier League that the opening matchday has passed with plenty of excitement and – in the positive sense – incident. Fans at Upton Park and the Madejski Stadium were able to celebrate top flight returns with victory for West Ham United over Aston Villa, and a dramatic late equaliser from the spot by Reading’s Adam le Fondre against Stoke City. Even where the scorelines were one-sided, neutrals could share in the pleasure of those who had overseen their respective 5-0 victories: the ever-ebullient and popular Martin Jol of Fulham, and Michael Laudrup – the ‘sexiest’ new addition to English football for those who fondly recall Danish Dynamite at Mexico ’86 – with Swansea City. The glamour tie of the first Saturday was undoubtedly Newcastle United’s 2-1 win over Tottenham Hotspur, the side that had pipped them to fourth (but not, as it materialised, a Champions League place) last May. However, it was quickly knocked off the agenda for analysis on this Tuesday’s edition of the JSports show Foot! by the 3pm meeting of West Bromwich Albion and Liverpool – a match that, but for a little more composure from the forwards, might well have ended as another five-goal drubbing. Relieved of his duties as assistant manager at Anfield via a single telephone call from human resources in June, Steve Clarke has finally been promoted to a shirt-and-tie and deserves all the plaudits for the Baggies’ merciless dismantling of his former employers. The 48-year-old Scot insisted that revenge was never on his mind, but his knowledge of the Liverpool players and foresight over their tactical approach allowed him to tailor a bespoke eleven and formation for the occasion. West Bromwich may only have had 40% of the possession, but their back four retained a Hodgson-esque sense of organisation while the side as a whole moved the ball forwards with far greater efficiency. 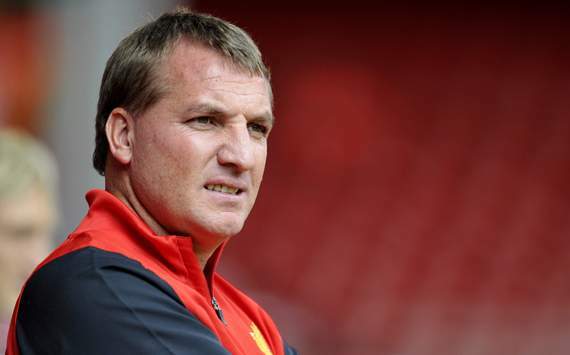 For Brendan Rodgers, it was “a bad day at the office” and hardly the ideal time to discover how 3-0 reverses for Liverpool attract a touch more media negativity than at Swansea. But while the home side were worthy winners, the scoreline was warped somewhat by the unfortunate (albeit correct) penalty decisions and dismissal of Daniel Agger that masked a fairly good performance for the men in red. They will need time to adjust to their new 4-3-3 system; defensive impatience must be eradicated, while the forward line requires greater balance and mobility to ensure that Luis Suárez is not left as an isolated threat. But their manager has a clear blueprint, and the composed passing shown from the outset in midfield should serve as an important platform for the development to follow. Ben Mabley will be taking his blackboard to provide Premier League analysis this season for the JSports programme ‘Foot!’ – Tuesdays at 10pm on JSports 3. As part of a collaborative initiative between Goal.com Japan and the satellite broadcaster JSports, I will be penning a column on the English Premier League this season for Goal.com’s Japanese and other Asian versions. Below is my introductory piece, written on the eve of the opening day and subsequently featured on Yahoo! Japan News. The overwhelming inclination in the immediate aftermath of Manchester City’s impossibly dramatic title triumph three months ago was to proclaim a changing of the guard. Once things had calmed down a bit, more lucid voices reminded us that Manchester United – second best only on goal difference after those two stoppage time goals by Edin Džeko and Sergio Agüero – were still a developing team with young players like Phil Jones and David de Gea who should be all the stronger for the experience. Then we all remembered that Sheikh Mansour would inevitably throw in another £100 million or so and shift the goalposts even further over the blue side of the Manchester horizon. Only this hasn’t actually happened – at least, not yet. The arrival this week of Jack Rodwell – and even then, most likely to replace the departing Nigel de Jong – was the first of a summer that has instead been curiously characterised by fiscal prudence and a standoff between Roberto Mancini and sporting director Brian Marwood. Time is running short to finally secure the exit deals for Emmanuel Adebayor and Roque Santa Cruz that might free up resources for the next star acquisition. As it is, the largely-unchanged City face the same questions of ‘second season syndrome’ as asked of any relative newcomer to success. Will we see a slicker, more mature operation now that the tag of bridesmaids has finally been lost? Or will they suffer from being the new big boys that everyone else wants to beat? The story surrounding the Robin van Persie transfer will have been an uncomfortable reminder to those at Eastlands of the struggle they may still face in earning wider acceptance. City were considered the obvious destination for the latest in a succession of Arsenal stars to leave the capital, but last season’s Premier League top scorer has been unambiguous in his view that the status and honour of playing for United were much more attractive than the Abu Dhabi ‘project’. For Sir Alex Ferguson, the opportunity to lure Van Persie and supplement a strikeforce that he has immediately compared to 1999 was clearly a no-brainer, but the deal still raises eyebrows for a number of reasons. The pound signs involved for a 29-year-old with one year remaining on his Gunners contract are a clear subversion of United’s usually thriftier approach under the abhorrent, debt-ridden Glazer regime. Bob Wilson and the Emirates faithful, meanwhile, are “bordering on anger” with a player whose public criticisms of Arsenal’s ambitions came during a transfer window in which Arsene Wenger pulled off the notable coups of Lukas Podolski, Olivier Giroud, and Santi Cazorla. That said, Van Persie has long had this summer in his sights, aware that it represented his final chance both for a payday and to choose the path that may best lead him to the professional success he desires. His disappointment over the losses of Cesc Fàbregas and Samir Nasri was well known, compounded by the desperation of that 8-2 defeat at Old Trafford, and only partially relieved by the 30 league goals that eventually shot Arsenal back up to third. Despite all the partisan cries of disloyalty, his exit was inevitable and actually represents good business for his former employers. As for United, they have undoubtedly taken on the riskier side of this deal, but in another Premier League season set to be dominated by Manchester, it will all be worth it if Ferguson’s men are the ones to reclaim their crown on goal difference. My latest blackboard column for Goal.com Japan sees Kashima Antlers come from behind to win 2-1 at home to Jubilo Iwata. Both of the long-time top two, Vegalta Sendai and Sanfrecce Hiroshima, have struggled for consistency in recent weeks, but not one of the tightly-condensed chasing pack has been able to put a run of wins together and properly take advantage. Jubilo Iwata might have moved to within four places and six points of the summit on Saturday evening, but were instead undone by a Kashima Antlers side that had a game plan and stuck to it. 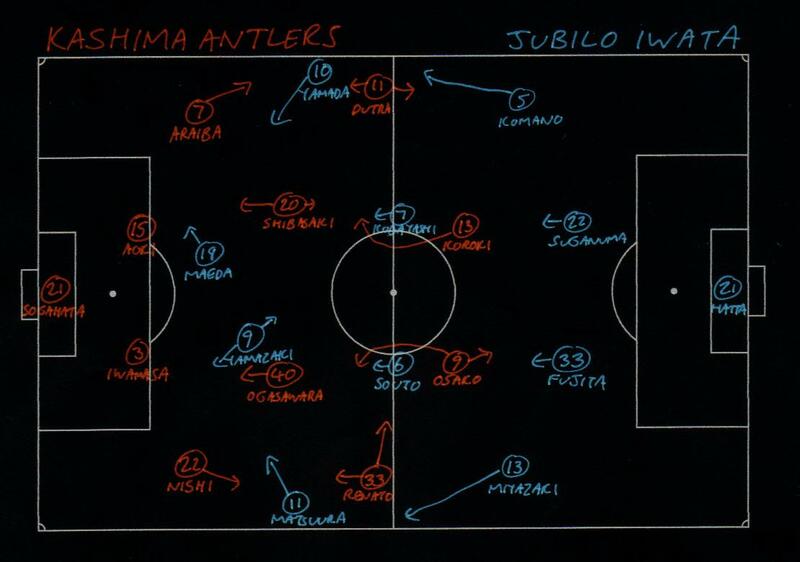 Faced with their hosts’ deep-lying, somewhat rigid 4-4-2, Jubilo were able to utilise their trademark forward movement within a 4-2-3-1 to look for space between the Kashima lines. Additionally, as so often happens when these two systems meet, they were able to augment their build-up play out wide with overlapping runs from the full-backs. Early on, there were three main progressive patterns of passing. Rodrigo Souto would play the ball out to Takuya Matsuura, with Ryohei Yamazaki frequently drifting forwards and left to offer a nice, shallow diagonal with Ryoichi Maeda inching right in response. Alternatively, Matsuura could develop play wider to the onrushing Tomohiko Miyazaki and overload the Antlers full-back, Daigo Nishi. On the opposite flank, Hiroki Yamada’s intelligent movement completed a dangerous right-sided axis with the two Japan internationals, Maeda and Yuichi Komano. This latter combination created the opening goal in just the second minute – Komano playing a 1-2 with Yamada out wide before sending in a cross for Maeda to head home at the near post. Daiki Iwamasa scampered across in a vain attempt to intercept; the left-sided centre-back, Takeshi Aoki, had been dragged to the touchline by Yamada. Quite simply, the opening quarter of an hour was all Iwata’s. Whenever they conceded possession, they would quickly get numbers behind the ball and press hard – especially the central midfielders, Souto and Yuki Kobayashi – to win it back. Kashima looked a little thrown by the early concession and were often compliant in the turnovers with their attempted route one passes. But they calmed down after 15 minutes to enjoy a sustained spell of possession with what was evidently a return to Plan A. The home side patiently passed the ball around the six deep outfielders, gradually pushing Jubilo backwards in the process. Renato often came inside from the right wing to support the midfield; confidence depending, Nishi occasionally took the resultant opportunity to get forwards. Crucially, they equalised quickly when the back-tracking Yamada collided with Yuya Osako, allowing Renato to demonstrate his not inconsiderable skill at direct free-kicks. Jorginho’s side could now adhere fully to their original strategy. The back four retreated, Gaku Shibasaki and Mitsuo Ogasawara sat only a short way ahead of them, and even the four attacking players dropped well back into their own half to close off space for their opponents. The visitors did create one chance when Matsuura dragged Nishi inside only to miss the return ball from the unchallenged Miyazaki, but they were otherwise frustrated by the Kashima tactics and forced into ineffective long balls themselves. In retrospect, the key moment of the match came ten minutes before the interval when Hitoshi Sogahata let a deflected Komano free kick slip through his fingers and behind the line, only for the ‘goal’ to be incorrectly ruled out for a non-existent shove by Souto. Kashima were therefore free to stay on script, and actually became more effective on the break after half time. On 70 minutes, Jorginho made what proved to be a decisive substitution when he replaced Osako with Yasushi Endo, who took up his usual right midfield position with Renato moving into the centre to sit behind Shinzo Koroki in what became a 4-2-3-1. The closer combination of Renato and Dutra, plus the former’s continued willingness to drop right back and help reclaim possession, added a touch of fluidity that contributed to the match winner five minutes later. From just ahead of halfway, Renato played the ball to the overlapping Nishi, who laid it off for Koroki and continued his run onwards. Kashima’s lone striker had been forced wide by Shunya Suganuma, but he managed to cut the ball back for Aoki to dummy and Nishi to fire straight at Naoki Hatta. Aoki was then on hand to knock the rebound into the vacant net. Hitoshi Morishita attempted to counter by introducing Yoshiro Abe for Matsuura – thereby switching to 4-4-2 and completing a reversal of formations – while Shuto Yamamoto replaced Miyazaki to offer further penetration from left-back. But it was too late. Having worked hard to track back and deny room all evening, Antlers weren’t about to stop now, and 2-1 it finished. The blackboard returns this week with a look at the Kansai derby between Vissel Kobe and Gamba Osaka. Gamba Osaka’s first visit to Vissel Kobe since the latter’s appointment of Akira Nishino was inevitably billed as master versus pupil. However, the overriding impression after 90 minutes was one of two sides rather lacking in completeness; with Nishino only a couple of months into his mission to impart his attacking blueprint upon Vissel, and the studious Masanobu Matsunami still struggling desperately to rescue Gamba from the chronic malaise that set in under his old boss’s immediate successor, José Carlos Serrão. Tactical interest, too, was limited by the similar and fairly straightforward 4-4-2 systems deployed by both coaches for most of the match. To his credit, Matsunami has overseen a slight improvement in performances – they couldn’t have gotten much worse – but confidence remains a very loose on-and-off switch. Tomokazu Myojin alluded to this before kickoff when he commented on the spate of goals that Gamba have recently conceded in the opening 30 minutes of matches, and the feeling of “what, again? !” he would get as yet another game began badly. It was undoubtedly with this in mind that the away side lined up very cautiously, maintaining two deep lines of four and advancing rather slowly when in possession. Kobe’s defensive line, by contrast, was quick to step up to halfway and looked to play the ball at speed, both across the midfield and forwards to the roving Keijiro Ogawa. Takahito Soma offered an additional threat with his regular overlapping runs along Takuya Nozawa’s left-hand flank as the hosts won a succession of early set pieces. But quite atypically, a Gamba back four missing Sota Nakazawa (perhaps that was the reason) dealt with the situation quite calmly and Matsunami’s men began to dominate possession from the midway point of the half. Their build-up play was patient – perhaps overly so – with left-winger Shu Kurata by far the main attacking outlet as Leandro, making his first start since returning from Qatar, served largely to create space for others. 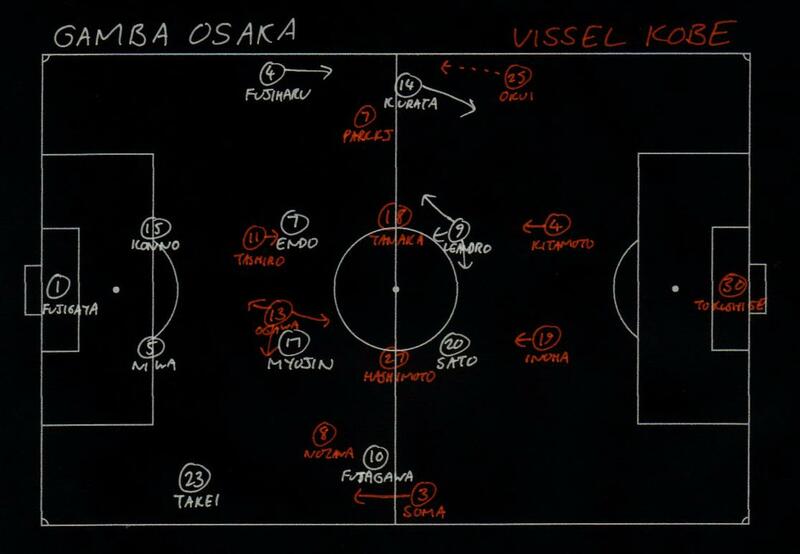 However, they often took too long to play a cross or killer pass, allowing Vissel to get back and clear. The hosts created the best chance of the first period when Soma got forward to fire a shot that Yosuke Fujigaya did well to push over. The differing atmospheres and priorities were highlighted at the interval, when Matsunami reminded his volante pairing of the need to maintain balance and defensive cover while Nishino told his to play with confidence and link the play quickly from back to front. Kobe pushed forward in greater numbers, with Nozawa and Park Kang-Jo moving slightly infield and right-back Ryo Okui now offering an additional option on the overlap. Gamba continued to mark up well and deny their opponents room, so Nishino was the first to twist with two substitutions. Ken Tokura came on for Yuzo Tashiro to serve as target man, while Yoshito Okubo replaced Park and offered a new source of danger cutting inside from the left, with Nozawa switching to the right. These changes were significant, but only after Gamba had taken the lead. Dropping deep into his own half, Leandro launched a move that ended with Takahiro Futagawa charging forwards but isolated on the right, and his hopeful shot was deflected over. Yasuhito Endo had already demonstrated his threat at set pieces with a corner kick early in the second half that had curled straight in – only to be disallowed for a push by Daiki Niwa – and only a fine save by Kenta Tokushige at full stretch prevented him from repeating the trick. But the subsequent, second corner was played quickly to the unmarked Futagawa, whose low shot deflected off Okubo and into the net. For the first time, Gamba stayed on the front foot in the immediate aftermath of the goal and pushed for another. But they failed to create a decisive chance despite the odd bit of pinball in the Vissel area and, ironically, soon conceded an equaliser instead. Okui beat Kurata to cross from the right towards Tokura and Ogawa at the near post. Fatally, makeshift right-back Takuya Takei was caught ball-watching and left acres of room for Okubo to continue his run to the far post and spectacularly volley home Tokura’s flick-on. Matsunami tried to mix things up with three late changes, but to little avail. (His inexperience is often visible during substitutions; most notably when jumping the gun and actually quelling Gamba fightbacks against Nagoya Grampus and Kashiwa Reysol in June.) 1-1 was a fair result, but the Banpaku side are reaching the point where they really need to turn any half-decent performances into wins.